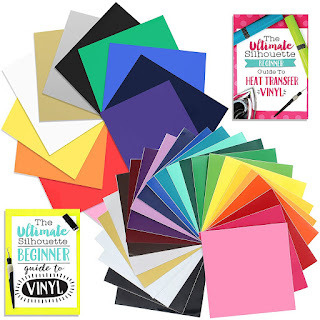 I know I can't be the only one who has stacks and stacks and stacks of scrapbook paper, but never the design I need at the right time. Happens every.single.time. Well, guess what - you can make your own patterned paper using Silhouette Studio. 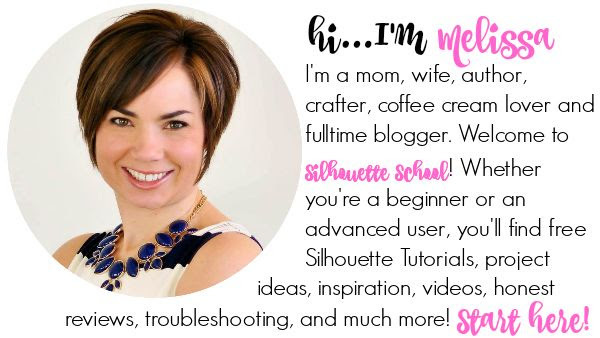 You will need Silhouette Studio Designer Edition for this - but believe me if you don't have it already - you'll want to get it after you see this. 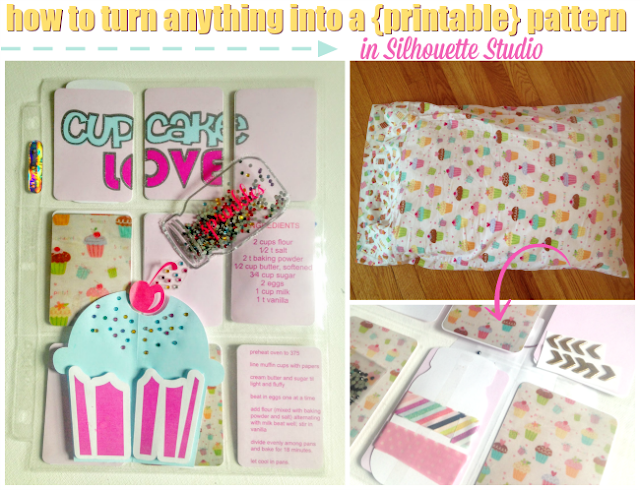 This is so cool...okay so I was in need of some cupcake paper because I was working on a cupcake inspired pocket letter (more on that in another tutorial). 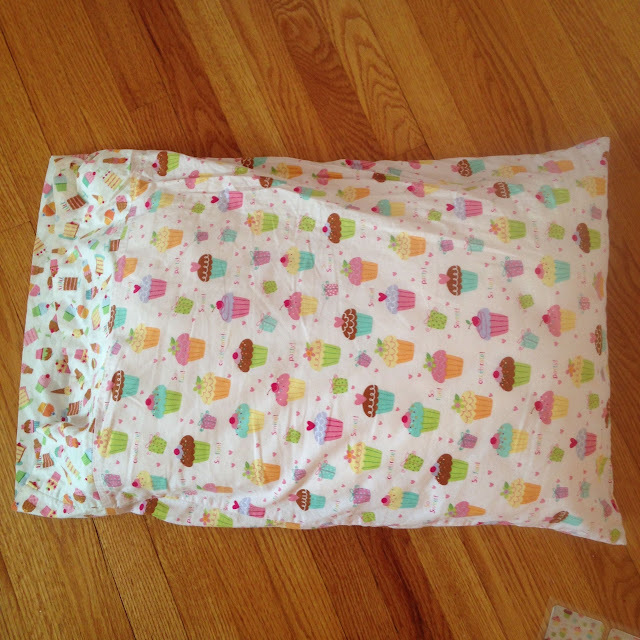 Anyway, of course I had no cupcake paper on hand...but (light bulb moment here) my daughter has a cupcake pillow case. First I snapped a straight on picture of the pillow case with my phone making sure there weren't too many shadows (or wrinkles). I also made sure not get the edges of the pillow case, just a large section of the fabric. You also want to make sure you have good natural light. Then I emailed the photo to myself and downloaded it onto my computer. 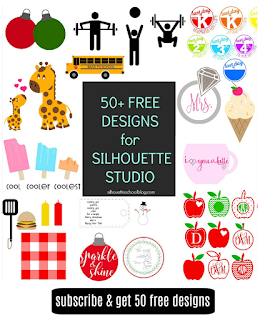 With Silhouette Studio open, I opened up the My Patterns folder by going to Silhouette Studio Library > My Patterns. 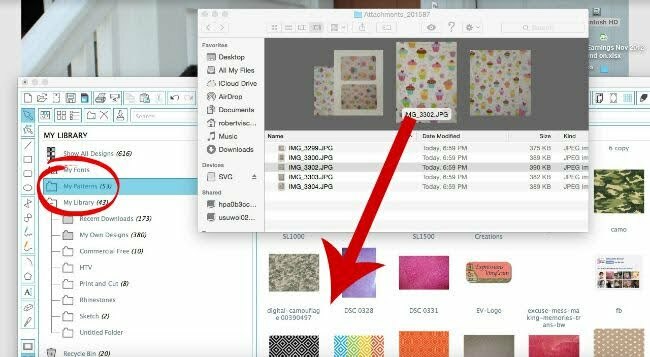 Please note, you can only add custom patterns to your My patterns folder if you have Silhouette Studio Designer Edition. 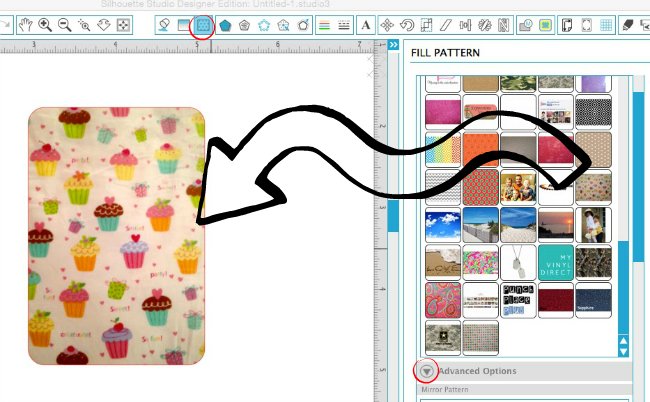 Then I simply dragged and dropped the photo of the cupcake fabric into the My Patterns folder...again you will only be able to do this if you have Designer Edition. I needed to cut a few 2x3" rectangles in the cupcake paper. 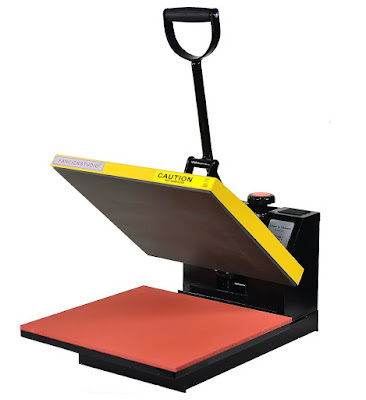 So in a Silhouette Studio work area, I drew out the design using the Draw a Rounded Rectangle tool. Of course it was transparent at this point with a red cut line around it. To fill it with the pattern, I selected the shape and clicked the "Fill Patterns" tool. All of the default patterns are at the top, but if you scroll down you'll see the patterns you have added to your My Patterns folder. 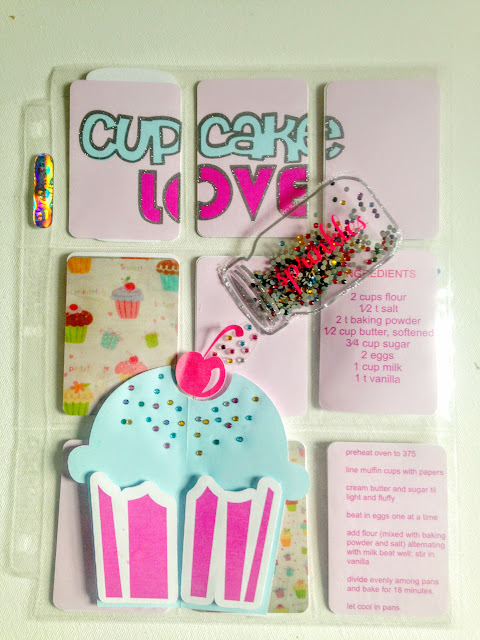 Then I just selected the cupcake pattern and my shape is filled with my custom pattern. You can leave the pattern the same size or you can make it larger or smaller by using the scale pattern tool which is below the pattern swatches - I did a few different sizes. Now just add your registration marks and get ready to print and cut! 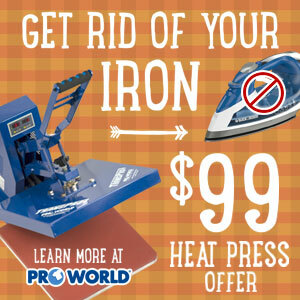 But think about all the possibilities, because you can do it with anything really...need some wood grain paper? Take a picture of a section of your hardwood floor. Want to coordinate a wall decoration that you're making with the drapes? Think about all the possibilities...they're endless, really! I never knew you could do this! Oh the possibilities... Thanks for sharing this wonderful tip! 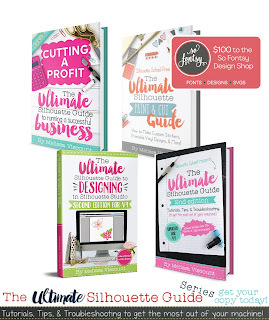 Thank you Melisa, so good of you to share and teach in practical way. Awesome! Thanks for sharing this information!! Wow, this is great! I will have to see if I can do this. Thank you for sharing tips like this for people like me who lack creative genius in some ways. WOW!!! Seriously, WOW!!! You are amazing and I am fortunate to have you be my brain as mine is 'out to lunch' too many days!! I would have never thought of that, I would have wasted gas and time searching in and out of stores for that one exact piece I needed. Many, many thanks to you!!! Sincerely! Could you scan the item instead of taking a picture? So amazing, you and the Silhouette!! 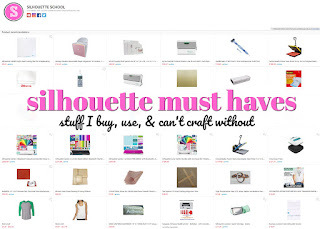 Of course, you have to be careful not to sell anything that's made from a scan of someone else's design. Like the cupcakes--the person who designed the fabric for the pillowcase likely owns the rights to that design. For personal use, I'm sure it's fine. By the way, comments aren't available on the mobile site (and they definitely used to be!) The mobile site is also crashing my iPhone browser pretty consistently. I don't know if those two things are related or not.